Heart and Sole: The mystery of the Hanging Gardens of Babylon - Solved? 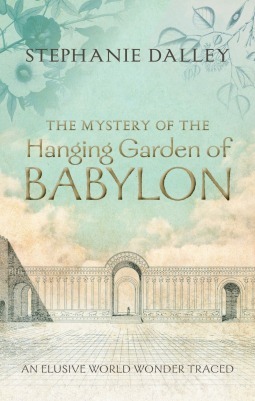 The mystery of the Hanging Gardens of Babylon - Solved? This is a discussion of a book that is to be released about August 1st, 2013. And it is a discussion of my hands-down favorite among the seven ancient wonders of the world -- bucket list sort of stuff. If I can't go to these ancient wonders -- The Colossus of Rhodes has always been my second favorite (I believe it inspired Tolkien to conceive the Argonath from the Lord of the Rings -- the movie satisfied my need to 'go' there) -- then I have to settle to be an armchair traveler. And Dr. Stephanie Dalley is surely the most competent guide one could have to lead me around the grounds of these mythical and mysterious gardens. She is an expert on Cuneiform (Babylonian) ancient writing and has thoroughly researched her new book "The Mystery of the Hanging Gardens of Babylon." Evidence for the gardens has never been found around Babylon. And little wonder, Dalley has concluded they were not in Babylon after all, but the work of Sennacherib (704-681 B.C. ), Assyrian King of Ninevah, where he boasted of his irrigation system and spectacular gardens. Nebuchadnezzar II, king at Babylon and putative builder of this wonder, never mentioned gardens when boasting of his legacy. See this recent History Channel online article for more. "Disclaimer: I received and read an uncorrected proof via Netgalley. There really is no other way to start, so here goes. I never thought that reading about a screw so could be so engrossing. Get your mind out of the gutter. I’m talking about Archimedes’ screw. And I’m not being sarcastic. Stephanie Dalley makes reading about the screw absolutely fascinating. I know it sounds unbelievable, but it’s true. The screw is important because the time and use of the device are central to the idea of how the famous Hanging Garden could’ve have been constructed. I should not that I do not hold a degree in ancient history. I have layman’s knowledge of the subject. Scholar might discuss and debate Dalley’s thesis on a deep level, but I cannot do this. Dalley’s book is well documented; her thesis is well supported and apparently sound. Dalley traces her book to a statement that an older audience member gave after a talk – the audience member had wanted to hear about the Hanging Garden and was rather disappointed that it had not been mentioned. This sparks Dalley’s quest to try to discover what the Garden might have looked like and how it might have been built as well as who might have built it. Perhaps the least interesting part of the book is the first chapter that deals with the historical sources that mention the Garden. A necessary part, true, but the book really gets interesting when Dalley moves into her discussion of whom and how. The discussion about the screw takes place here. It is part of a wide ranging look at where and which ancients might have invented those devices. The answer isn’t always the Ancient Greeks. Dalley succulently challenges and debunks the overused idea of the Greeks inventing everything. While such argument relies on an almost minute detail, Dalley makes her discussion of such detail not only easy to follow, and, if not riveting, engrossing. The same is true when Dalley takes a look at who built the garden. Perhaps not a romantic story, but Dalley move her thesis and take the reader with her as she builds her argument. It makes her points easy to follow and is to convincing. The book concludes with the idea that the Garden might have formed the basis for famous gardens in literature, in particular the idea of the Garden of Eden as expressed in various literature, and not only the Bible. The Garden of Eden idea is rather interesting and does make one think. She also made me look at Milton in a different way, and considering how I feel about Milton, that’s saying something. I have to say thanks to both Netgalley and Oxford Press for allowing me to read this. I would’ve read it eventually; most likely long after it came out in paperback. I would have been the poorer for that. This book really does change a layman reader’s view of one of the Seven Wonders of the Ancient World." In my novel 'Eden's Womb' in Book VI, you'll find a garden of similar magnificence visited by our protagonist, Adam. It's what I'm writing about this morning. And it was during the research that I came upon this exciting new book. This is bucket-list big :-) I want it!